This page helps you easily find the information you seek regarding Cherokee, our business activities, and opportunities for you to profit by working with us. 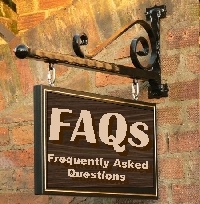 This FAQs section (Frequently Asked Questions)is primarily focused on Cherokee and topics related to our business activities. It is beyond the scope of this FAQ to be a comprehensive information source regarding real estate investments, mortgages, Tax Sale Certificates, foreclosures, or related topics. The information in this FAQ is not intended to be comprehensive. In some cases a Question will lead to other Questions, or would require a great deal of space to answer completely. This FAQ section is expanded and refined continuously in response to feedback we receive. No. We are a private, for-profit business. However, there is nothing contradictory about being a commercial enterprise, and wanting to do good. In fact we believe that it's good business to do good. Is Cherokee a social service agency? No, we are a private, for-profit company. Is Cherokee a national company? It depends. We buy financial assets like mortgages nationally, but for real estate we try to concentrate in certain areas, including New Jersey, San Diego County California, and parts of Florida. Why only own real estate in a few areas? Property management is a very local endeavor. In order to properly renovate, lease and manage a property, and in order to be as responsive and responsible a landlord as we are, a property must be located within an area where we already own other properties, or it must be large enough to justify hiring local contractors, brokers and managers. Will you consider a real estate deal in other areas? What kinds of properties does Cherokee buy? Click here. What exactly is a Non-Performing Asset? Why should I be concerned about board-ups? Why does Cherokee try to fix up existing properties instead of just tearing them down and building new ones? It's faster because zoning board approvals usually not necessary. Further, laws have often changed since the existing structures were erected, a replacement of the same structure may no longer be feasible. To see more please click here. To view our current employment opportunities, please click here. No. Our affiliate company, Cherokee Financial buys existing (non-performing) mortgages from institutions, but it does not originate new loans. Are you the Cherokee that built the IKEA and Encap golf course? No. There are thousands of companies called Cherokee, and dozens in the real estate business. One of them, which coincidentally was also in the business of cleaning up and developing contaminated properties in New Jersey, is Cherokee Investment Fund. Their headquarters is in Raleigh, North Carolina at (919) 743-2500. As of 2011 we believe they have ceased operations in New Jersey. Is Cherokee Realty a Native American company? No. See our list of "Other Cherokees"
Is Cherokee a woman-owned business? No. We are principal investors. We own all the real estate, mortgages, and other assets that we manage. Are you the same company that makes Cherokee brand clothing? No. Cherokee Inc in Van Nuys, California licenses the Cherokee brand for apparel, house wares, footwear, and other consumer goods. See our list of "Other Cherokees". Is Cherokee a computer company? No. Previously some of our partners were involved in a company that helped government agencies acquire and manage information technology. That business has since been sold to its employees. It continues to prosper. Does Cherokee have a formal Ethics Policy? Yes. See our Ethics page. Can Cherokee help me? I need legal advice. No, we cannot provide legal advice. If you need an attorney, but you cannot afford one, you may be able to get free or discounted legal services. To learn more, and to locate legal services in your state, please see our Legal Aid web page.